More and more health reasons for eating dark chocolate keep coming in. Many will be pointed out here, then explained further in the sources indicated by numbers in parenthesis. But first, understand that organic dark chocolate brought into the market place under fair trade agreements is best. Some of the major cheap chocolate producers use child slaves in Africa to pick cacao. The more dark the chocolate with less sugar, milk, and other ingredients, the closer it is to cacao. 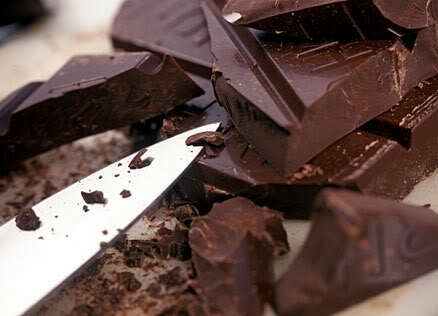 A range of at least 70% to 90% cacao in dark chocolate is both tasty and healthy. Milk chocolate contains milk, which negates the health benefits, and sugar, which feeds cancer cells. Avoid it. Interestingly, one doesn't have to gorge lots of chocolate every day to get the health benefits. A little treat, like a square or two daily will support good health. Improves brain function Nottingham University professor Ian MacDonald used MRI analysis to determine improved brain activity with people who had just consumed cocoa drinks. (4) Hopefully they didn't have to undergo too many MRI scans that would fry their brains! There you have it many reasons to enjoy organic dark chocolate that is at least 70% cacao. There are brands with 80% to 90% as well. These aren't your kiddy chocolates with lots of sugar or milk or creamy nugget fillings, etc. They are semi-sweet at best. The more bitter the better. It's not difficult to get used to if you really like chocolate. Enjoy chocolate with the knowledge that it's actually good for you.